Horsetail Tea comes from a unique, feathery, reed-like plant with a history that goes back to prehistoric times. 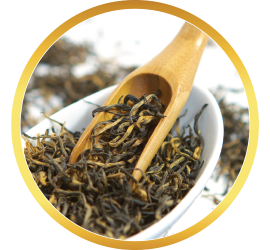 Its smooth, earthy flavor makes a welcome cup of tea day or night. The horsetail plants are long and thin, like reeds, and bear skinny leaves that give it a wispy appearance, much like a brush. The origin of its name has been debated, but most believe the name refers to its resemblance to a horse tail. However, it is also possible that the name came from one of its historic uses, when the branches were tied to a horse’s tail to chase away flies. Horsetail was also employed as natural brush used to clean cookware. However, it was mainly used as an ingredient for cooking, served raw or cooked like asparagus. Way back in Ancient Rome and Greece, physicians prescribed horsetail as a diuretic, as it was reputed to encourage abundant urine flow. Why is this a good thing? 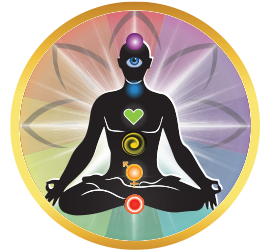 Anyone who has dealt with water retention, or kidney ailments know how vital it is for the body to be able to eliminate excess water. Germany’s equivalent to our FDA even approves horsetail as a treatment for edema. Horsetail is the common name for a plant, Equisetum, the only living genus in Equisetaceae, a family of vascular plants that reproduces by spores, rather than seeds. Horsetail is considered a “living fossil” because it’s really, really old, perhaps more than one-hundred million years! Horsetail is most commonly found in North America (Canada and the norther parts of United States), and got its name due to its branches that resemble a horse’s tail. What Does Horsetail Taste Like? After dropping your unbleached tea bag into your cup of water heated to just below boiling (205° to 210° or so), let it steep 4-8 minutes. Now, take a good gaze at your cup of Horsetail Tea, and feel the power of amber enter your senses. Your first swallow may not be too surprising when you know that the plant was named after a horse’s tail, which, visually, also somewhat looks like green hay. 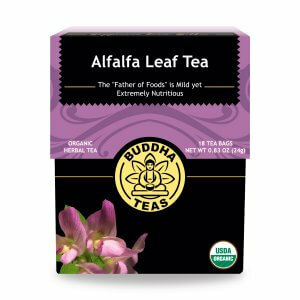 In other words, this earthy tasting tea brings to your cup a feeling of freshness, groundedness, and a smooth, nurturing flavor. 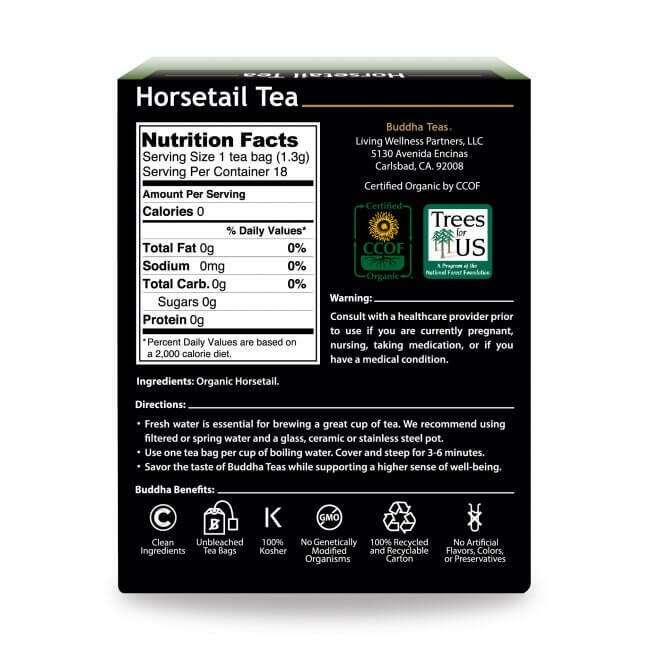 Complex, smooth, and refreshing, try enjoying a cup of Horsetail Tea as a caffeine-free morning beverage; we think you’ll feel quite satisfied! 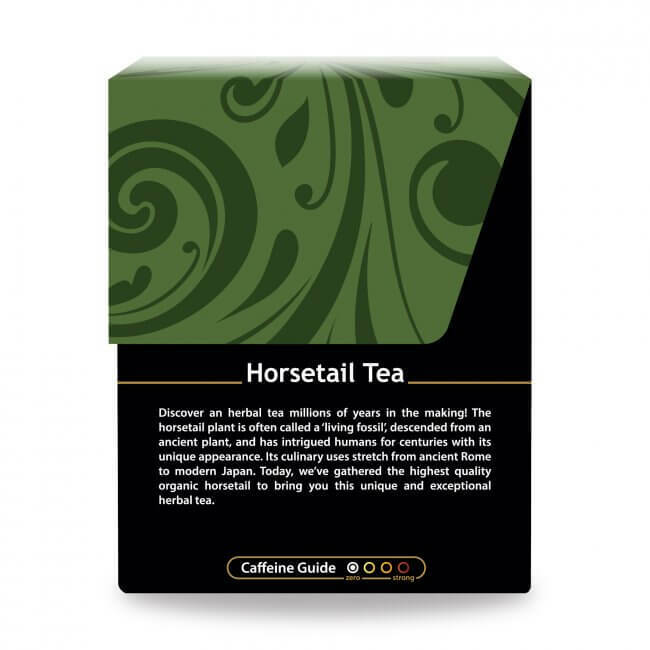 Horsetail Tea can be complemented with a bit of honey or lemon, as desired. 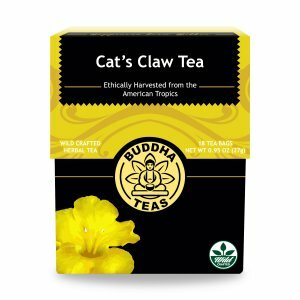 Finding specialty herbal teas like this for sale locally isn't always easy. 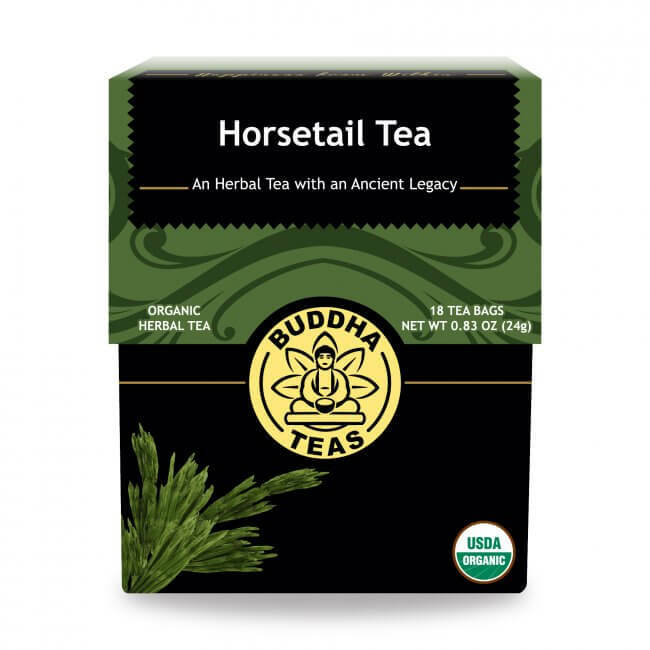 Luckily, you can find good quality Horsetail Tea for sale here from Buddha Teas. 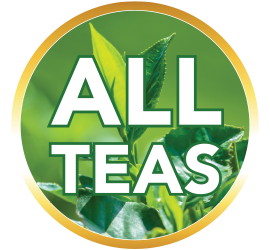 All of our teas are carefully packaged in unbleached tea bags. 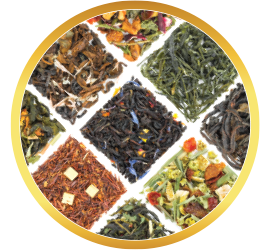 We inspect every blend to insure that only the best herbs are used for our teas. Purchase all the Horsetail Tea you need to stay well stocked, or mix-and-match with other herbal blends. 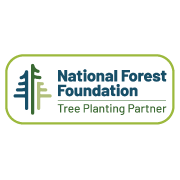 We enjoy helping you save money as well by offering coupon codes, discount deals for bulk purchases, and free shipping for all orders of $50 or more. Phenomenal tea. I immediately saw results with my hair. The taste is light and soothing. I love this tea. It has a mild very good taste and it really helps control my appetite. I've been drinking it at night and I found I sleep better. I don't understand why the stores don't carry this but the website is easy to use. I will be placing another order, as I don't want to run out. I got this because I heard it’s great for hair growth & balancing the system in general. I wasn’t sure of the taste, but I’m pleasantly surprised. It’s very subtle & I find myself wanting another cup right after one I made. That usually doesn’t happen to me with many medicinal teas. Give this a try! You’ll love it. My chiropractor recommended horsetail tea for some serious digestive issues. 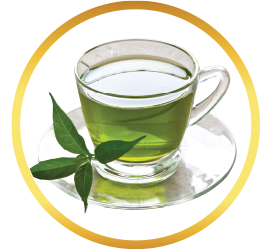 I found it on your website and drank it every morning and at night a variety of the other blends. On a follow up visit about a month later the improvement was very noticeable and so easy to implement. Thank you for carrying it. Review Title: This tea is a life saver. 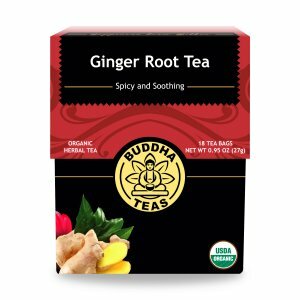 This tea is a really great way to reduce hair loss. I really get very easily stressed out since I was in high school and now that I’m a college student. But, I’m noticing a difference between the cups of tea that I drink and the results are great. I would recommend this tea to anyone who wants their hair growing back and to reduce hair breakage. The box the tea came in it was smooth and it was really eye catching. Shipping and handling of the package was really fast. The tea came on time to my apartment complex. I LOVE this tea!! 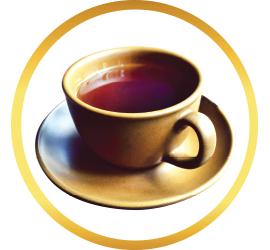 Not only does the tea taste great, but the diuretic properties have really improved my hearing! Sounds weird - right? Here’s my story - my audiologist sent me to a specialist who prescribed a brain MRI to make sure I didn’t have a tumor. During that first visit, my hearing was so bad that I had to ask the doctor to face me when she was speaking. She told me some people find relief by taking a steroid or a diuretic. Because I do not like taking medications, I looked up natural diuretics on the Internet. 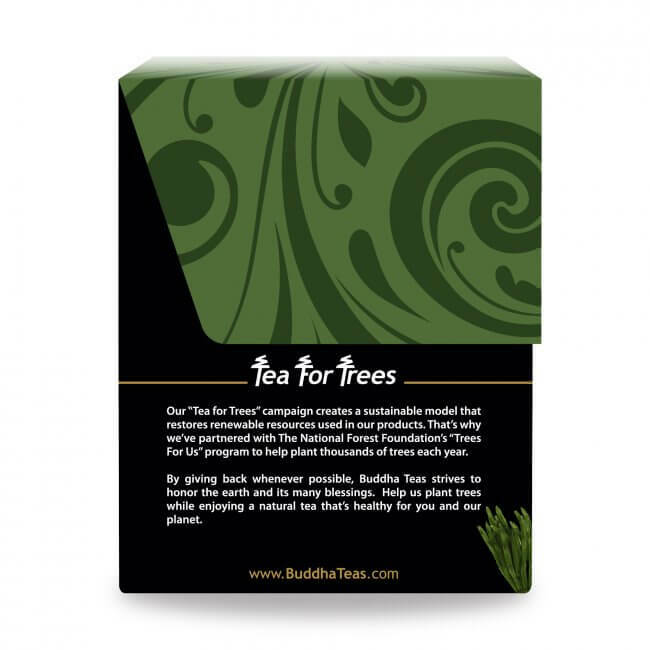 I have been buying Buddha horsetail tea ever since. My audiologist could not believe how much my hearing improved! I have hearing aids that u don’t really need anymore. Thank God for this tea. Great packaging, great taste, easy to use, works as described. Strongly recommend. This tea is amazing. I LOVE it. To spruce up the flavor I do like to add a squirt of lemon juice or sometimes a sprinkle of cinnamon as well as honey. But I'm not kidding,,, I bought it and drink a cup every night and my hair and nails starting growing after a few years of not seeing any growth it seemed. 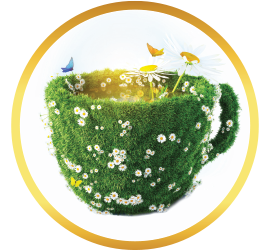 I beleive this tea is a miracle! I can never be without it!!! Tastes wonderful. 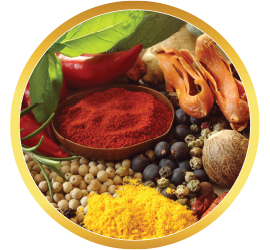 Quality, ingredients made with care and love. My favorite teas!